We all have preconceptions in life. Predetermined ideas of what is right and wrong based on our own upbringing, faith or lack of it, and individual life experiences. Preconceptions in and of themselves are not necessarily a bad thing, but sometimes challenging them can soften hearts and lead to opportunities for love and grace. 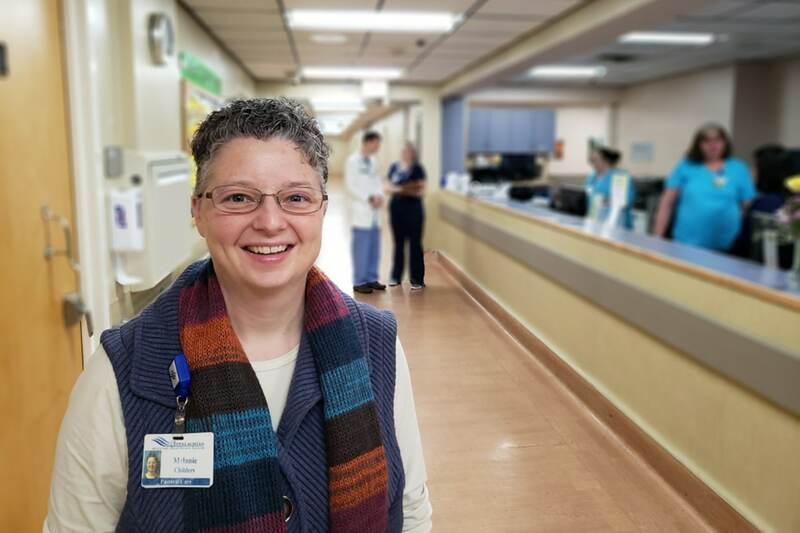 Few people have borne witness to more changed hearts during moments of crisis than Melanie Childers, the Director of Pastoral Care at Appalachian Regional Healthcare System (ARHS). For more than 20 years her ministry has allowed people of all faiths to feel safe and spiritually cared for while receiving their medical treatment in the High Country. Melanie was born and raised with classical and sacred music in her veins. Her father, Terry, served as the music minister at their church near their home in Concord, NC. Her mother, Betty, served as the church organist and together they managed all eight of the church choirs, including Melanie’s personal favorite, the hand-bell choir. Melanie felt called into ministry at an early age. She took the initiative to pray, memorize scripture and to make her own profession of faith at seven years old. She also managed to skip the stereotypical “preacher’s kid” stage of rebellion. Rather, her only complaint came at the hands of her parents, who insisted that she wore a traditional dress each week for church. A rule she loathed, but reluctantly followed in order to keep the peace. After finishing fourth in her high school class, Melanie went on to graduate from Mars Hill University with a bachelor’s degree in Journalism. She then landed her first job as the managing editor for the American Choral Directors Association in Oklahoma. Melanie struggled in seminary. She took pride in the fact that she could balance her school work with her job as a newspaper reporter. However, she sensed that not everyone was happy with her career choice. Outside pressure in the form of voiced disapproval came from those who felt that pastoral training at a seminary was intended only for men. Melanie went on to complete a two year chaplaincy program at Carolinas Medical Center in Charlotte, NC. For chaplains, Clinical Pastoral Education (CPE) training is similar to what residency training is like for doctors. The training program brings theological students of all faiths into supervised medical encounters with patients in crisis. This on-the-job training equips chaplains with the skills necessary to care for the various spiritual and emotional needs of patients and their families. 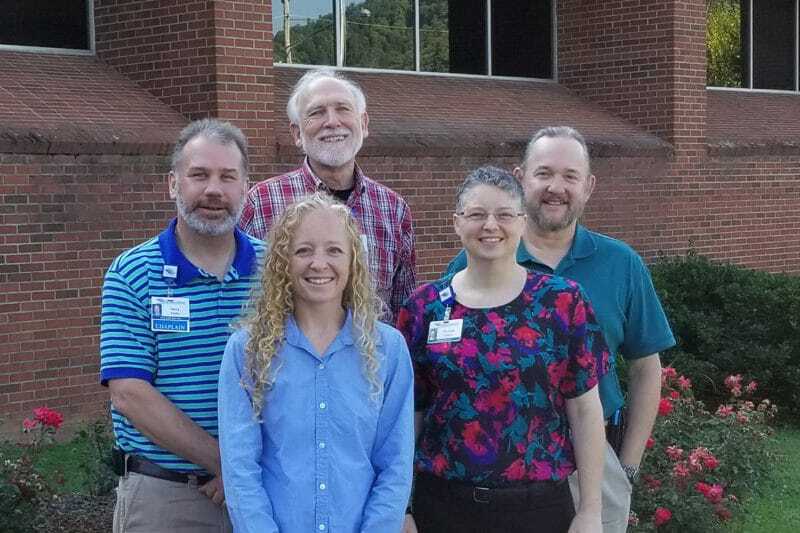 After completing her CPE program, Melanie applied for two chaplain positions, one at a hospital in Norfolk, VA, and the other at Watauga Medical Center in Boone, NC. Not surprisingly, Melanie keeps to a purposeful routine at the hospital. Each morning she reviews the hospital census in order to determine which patients had either requested or been referred to a chaplain. She then works with an interdisciplinary care team to make rounds throughout the healthcare system. Trained clinical chaplains are often referred to as “Intimate Strangers” for their ability to carefully enter into family dynamics in order to provide spiritual comfort. 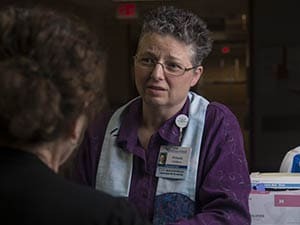 At ARHS, Melanie and her team of staff chaplains are often called upon to provide crisis intervention, bereavement care, spiritual assessments, religious rituals, and pastoral conversations that are consistent with the patient’s faith tradition. Some faith traditions ascribe to strict medical guidelines. Melanie is well-versed in this area and frequently makes notes in the medical record to ensure that faith-based medical requests are known and honored by the attending medical team. Melanie states that her faith has grown and evolved over the years. “Working with people of all faiths and people of no faith invites you to expand outside the boxes of your youth,” she explained. However, her spiritual beliefs continue to guide her compassionate care for people. Melanie’s job requires ordination and endorsement from a recognized faith group. These credentials are granted to her from the United Church of Christ. She is an active member of the High Country United Church of Christ, but also visits regularly in other High Country congregations, and occasionally provides pulpit supply for various churches. In 2000, Melanie became a board certified chaplain with the Association of Professional Chaplains. She is active on the state and local levels of her professional field, and served on the board of the Association of Professional Chaplains from 2004-2007. She also oversees the AppFaithHealth program, co-chairs the hospital’s ethics committee, and coordinates the organ donation program, palliative care program, and supervises interns in both chaplaincy and counseling. Despite the rewarding nature of her work, Melanie does admit that it can and often does take an emotional toll. To recharge, she meditates and enjoys spending time outdoors with her best friend and life partner Cath Hopkins. The couple tied the knot in 2014. After having spent the better part of her career ministering to families in crisis, Melanie was recently asked whether or not she believes in miracles. Now in her twentieth year of service, Melanie jokes that she knows where every tissue box is located in the hospital. To that end, she also keeps her “spiritual crash cart” well-stocked with warm blankets, Bibles, devotion books, rosary beads, anointing oil, music, labyrinths and some non-traditional items like coloring books.